Kenny Omega speaks on his AEW deal and arriving at his decision, Brock Lesnar advertised for upcoming Raw episodes, fantastic OTT video, thoughts on the AEW presser, UFC back on DirecTV, Bellator deal with Sky Sports & lots more. **Phil Chertok will join me for a UFC 234 POST Show this weekend to run through the card from Melbourne, Australia. **Wai Ting and I put out a bonus show Thursday night reacting to the All Elite Wrestling press conference and the news coming out of Las Vegas. We discussed the announcement of Kenny Omega joining the group, all the talent announcements, matches made for Double or Nothing, expectations for the show, what worked and didn’t at the presser, and more. **The free version of the Café Hangout is available as Wai Ting and I welcomed Brandon Howard Thurston of the Wrestlenomics podcast to chat the WWE’s 2018 year-end earnings report, a deep dive into what the numbers told us, a discussion on their live event business, the deal with the General Sports Authority in Saudi Arabia, how the stock reacted, and their statements for 2019 and beyond. This was a great chat and I encourage you to check it out as we Brandon joined for close to 40 minutes. Plus, Wai and I go through the latest news from the past few days and we are joined by “Brandon from New Jersey” on the phone. You can download the audio version or watch the video. **We have our monthly MCU review out for members of the POST Wrestling Café. This month, Wai Ting and I reviewed Iron Man 3 starring Robert Downey Jr., Gwyneth Paltrow, and Guy Pearce. We discussed how this film ranks with the other Iron Man films, the difference between Shane Black’s approach to Jon Favreau, the controversial handling of The Mandarin character, Aldrich Killian as a villain, and a discussion about “Blue” by Eiffel 65. This show is available for all members of the POST Wrestling Café. We do monthly MCU reviews and the March review will cover “Thor: The Dark World”. -He signed the deal with AEW Thursday morning and it for four years, so he will be 39 when the deal is up. He has the freedom to work dates with New Japan Pro Wrestling. -He was very complimentary towards the WWE and their offer for him, he noted WWE is not a risk to succeed and he could turn his brain off and allow others to write for him while AEW does represent a risk and that does entice him. There were a lot of dream matches in WWE for him but working with his friends and unique talent from around the world in AEW was a big factor. -Omega plans to relocate to America, he would love to have Kota Ibushi in AEW and would expect to see him here in the future. 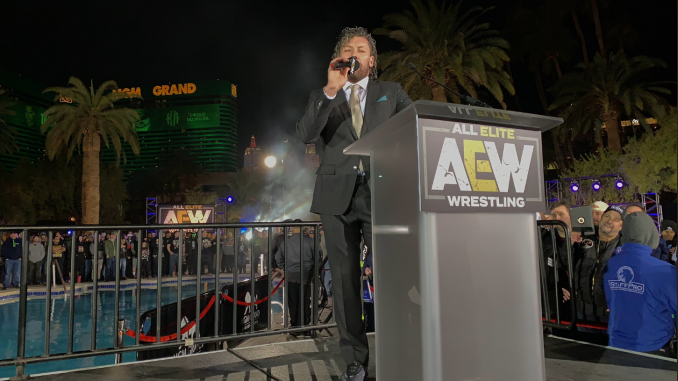 **All Elite Wrestling held their second press conference on Thursday night in Las Vegas with numerous announcements. The expected arrival of Kenny Omega was saved for the end with the former IWGP heavyweight champion introduced as labeled as an Executive Vice President with AEW. Omega gave a speech and was confronted by Chris Jericho to seemingly set up a rematch between the two for Double or Nothing on May 25th. The other angle featured The Young Bucks being attacked by Pentagon Jr. and Fenix after the Bucks were challenged to determine the best tag team in the universe. AEW also announced that Sonny Kiss, Sammy Guevara, Chuckie T., Beretta, Yuka Sakazaki, Aja Kong, Kylie Rae, Nyla Rose, and CIMA would all be part of Double or Nothing. CIMA was challenged by Christopher Daniels to find two partners from OWE to face SCU on the show, Nyla Rose confronted Rae and teased that match up and Hangman Page vs. PAC was made official. The major news is still to come with the group’s pending television announcement, which will be the telltale sign of their success by securing a high paying rights deal. In the interim, the focus is on Double or Nothing and filling the MGM Grand Garden Arena over Memorial Day weekend. The Wrestling Observer website reported that almost 12,000 requests for the pre-sale code were made through the All Elite Wrestling website Thursday night. That number suggests a legitimate possibility that they will have another immediate sellout. We did reach out to an AEW official for confirmation on that figure and had not heard back at the time of this writing. The group has managed to build a lot of buzz and anticipation for this event and by extension, a new national wrestling promotion that they believe will be viable. The mixture of talent has been a strong selling feature. They have their top stars with a high recognition factor and respective fan bases but are filling out the roster with fresh names that have not had national exposure. There was a time in 2005 that the nucleus of talent in TNA was in the same boat where they had a pool of talent that had never wrestled for the WWE, their exposure was limited to fans of Ring of Honor or the independents but represented the next generational wave of talent. When they got to Spike TV, they were judicious in the talent mix where they had established names like Sting, Kevin Nash, Jeff Jarrett, and Scott Steiner but the core was AJ Styles, Samoa Joe, Christopher Daniels, Chris Sabin, Petey Williams, Sonjay Dutt, Austin Aries, Alex Shelley etc. By 2007, you could see the shift and it became a game of scooping up as many national names that became available and TNA failed to maintain an identity because they were borrowing from someone else’s. The hidden value of Being the Elite is the undeniable confidence those guys must have in getting talent over through a YouTube show. It’s one thing to make your friends laugh and tailor towards a niche audience, but when it leads to t-shirt sales, more bookings, and an arena full of fans that were up to date on all the characters and their sidebar issues from BTE, it shows the effect that show has had. Once you have that confidence, it allows you to take more chances and in the case of new and undiscovered talent give the audience a new flavor. **The WWE has removed Seth Rollins from the advertising for this month’s live events. Internally, it is listed as a back injury that he is dealing with. We were told he will be evaluated when he is at the Raw tapings and therefore could end up being cleared before the estimated period. **Brock Lesnar is being advertised for Raw on February 18th in Lafayette, Louisiana on the night after Elimination Chamber to start the focused promotion of WrestleMania and his match with Seth Rollins. Lesnar is also being advertised for the February 25th show in Atlanta. UPDATE: The WWE has now removed Lesnar from the advertising of both episodes. **The Raw crew starts their tour in Ottawa, Ontario tonight with Braun Strowman vs. Baron Corbin advertised in the main event along with Bobby Lashley vs. Drew McIntyre vs. Finn Balor. On Saturday night, the Raw crew is in Oshawa, Ontario. The SmackDown crew starts Saturday in Dekalb, Illinois with AJ Styles vs. Randy Orton and Asuka vs. Charlotte Flair advertised with Becky Lynch also advertised for the show. **Ronda Rousey is scheduled for Sunday’s Raw house show in Saginaw, Michigan and is advertised for a match with Nia Jax. **The website for the Quicken Loans Arena in Cleveland is advertising Ronda Rousey for the Fast Lane event on Sunday, March 10th. The site is also listing a three-way match with Daniel Bryan vs. AJ Styles vs. Samoa Joe for the WWE title and Bobby Lashley vs. Finn Balor for the Intercontinental title. **OTT has released an incredible promotional video for the forthcoming match between Jordan Devlin and David Starr on February 17th in Dublin for their HomeComing card. The video was produced by Shaun Ryan of Crooked Gentlemen, who also produced the excellent video prior to Devlin’s rematch with Walter last year. The video details the entire history of Devlin and Starr’s friendship, Devlin’s two losses to Walter, how both want to be the one to conquer Walter, Starr costing Devlin that moment and setting up this personal grudge match. The winner of the match will challenge Walter next month on March 16th at ScrapperMania V.
**Roman Reigns (Joe Anoa’i) is scheduled for a guest spot on the Nickelodeon program “Cousins for Life”. The episode will be airing on Saturday, March 2nd at 8:30 pm Eastern. **ROH announcer Ian Riccaboni and his wife are about to have their second child and therefore Riccaboni will not be at the shows in Florida this weekend. He wrote a lengthy story explaining the circumstances around the birth of the couple’s first child in November 2016 when Riccaboni was working five jobs and attempting to pay off enormous student debt. Riccaboni was on an airplane and got the word his wife was going into labor and he landed and sped home in a rental car making it to the hospital minutes after the birth. This time, he booked the weekend off right after he got a new deal with ROH and a raise. He had never told that story to the main people at the promotion and they gave him the weekend off despite it creating a lot of added work for others and how grateful he is to be his wife this weekend. It’s a really fantastic story and well worth reading. **ROH is holdings shows in Florida this weekend. On Saturday, they will be taping television in Lakeland at the RP Funding Arena with the following matches: Jeff Cobb vs. Silas Young for the Television title, Villain Enterprises vs. The Kingdom for the ROH six-man tag titles, Zack Sabre Jr. vs. Rocky Romero, Jay Lethal & Jonathan Gresham vs. Coast 2 Coast, Dalton Castle vs. Kenny King, Rush vs. Tracy Williams, and The Briscoes & Shane Taylor vs. Shinobi Shadow Squad. **New Japan’s Road to the New Beginning card on Saturday will be streaming at 3 am Eastern from Osaka. The main event features Hiroshi Tanahashi, Kazuchika Okada, Togi Makabe, Toru Yano & Ryusuke Taguchi taking on Jay White, Bad Luck Fale, Taiji Ishimori and the Guerrillas of Destiny. Monday is the big New Beginning in Osaka card at 3 am Eastern with Hiroshi Tanahashi defending the IWGP heavyweight title against Jay White. **Ring of Honor announced Thursday that they will be hosting their annual Festival of Honor on Friday, April 5th at the Hulu Theatre adjacent to Madison Square Garden. The event will run all day beginning at 10 am until 6 pm the day before the G1 Supercard event at Madison Square Garden. Tickets will be available to Honor Club members next Wednesday and on sale to the general public next Friday for $39 if purchased before March 20th. **New Japan is also running an event on Thursday, April 4th called “New Japan Matsuri” at Japan Village in Brooklyn that is free to attend between Noon and 6 pm. They are advertising appearances by New Japan wrestlers and a merchandise booth. **The NWA has announced that New Japan Pro Wrestling and CMLL will be sending teams to the Crockett Cup tournament on Saturday, April 27th in Concord, North Carolina. **The WWE has announced that Pat McAfee has signed on with the company and will be doing more beyond his role as an analyst on the NXT TakeOver pre-shows. **AIW has announced that Tom Lawlor will be working their WrestleMania week event on Thursday, April 4th in Jersey City at 11 pm. Lawlor will be wrestling for MLW earlier that night at the Melrose Ballroom. The AIW event is part of The Collective series of events at the White Eagle Hall. Earlier this week, the promotion announced Damian 666 for the same card. **Pentagon Jr. and Rey Fenix have been booked by AIW for Friday, May 17th at The Odeon in Cleveland, Ohio. The show is titled “Keep Their Heads Ringin” and bell time is 7:30 pm with tickets priced at $30 ringside and $20 general admission. **Ring of Honor has announced dates for June 1st in Kent, Washington and Sunday, June 2nd in Portland, Oregon for their “State of the Art” shows. **The WWE stock was up almost 3% on Friday and closed at $85.82. **The UFC 234 pay-per-view takes place Saturday night from the Rod Laver Arena in Melbourne, Australia. It’s a two-fight show when it comes to general interest with Robert Whittaker growing into a big star in Australia and New Zealand, although has failed to crack through as a star outside it. Kelvin Gastelum is a sizable underdog but also a fighter that has defeated quality opponents throughout his career and should not be written off. Whittaker has only fought twice since July 2017 as he had two wars with Yoel Romero spread over ten rounds. Whittaker has been undefeated since coming up from welterweight and should be favored in the fight. The co-feature sees Anderson Silva return for the first time in two years against surging star Israel Adesanya. On the surface, this feels like a changing of the guard style fight where Adesanya is poised to run through an older and slower Silva. Adesanya is a huge betting favorite and is likely to cause many problems for Silva, who is now 43 and has one victory since July 2013. Dana White has called this a title eliminator fight and there isn’t a compelling argument for another other middleweight to fight for the championship next. **The UFC has announced they have reached a one-fight agreement with DirecTV that will allow UFC 234 to be available on the U.S. pay-per-view outlet. The promotion initially stated that it would not be available to DirecTV customers as the two sides had been unable to reach a deal. UFC president Dana White provided the update Friday that Saturday’s pay-per-view will be available on DirecTV and they are working on a deal. **The big news out of Bellator this week is the news that they have entered a one-year agreement with Sky Sports. This will allow viewers in the UK and Ireland to watch Bellator’s events live, beginning with next Saturday’s Bellator 216 card from Uncasville, Connecticut headlined by Paul Daley and Michael “Venom” Page at 3 am local time. The announcement stated that the deal calls for a minimum of 20 Bellator events to air on the network throughout the year and will include the upcoming Bellator 217 event from Dublin that airs live at 9 pm in the UK and Ireland on February 23rd. Sky Sports is the WWE’s broadcast partner in the UK and Ireland, which airs Raw, SmackDown, and Main Event among its programming. The WWE’s deal with Sky Sport expires at the end of the year with the WWE previously announcing they would be announcing their television deal by the end of 2018, which did not happen.